This post was written by Stephen Van Dyk, Librarian, Cooper Hewitt, Smithsonian Design Library. The Cooper Hewitt, Smithsonian Design Library recently obtained this renowned example of early 20th century book and graphic design entitled Dlja golosa (For the Voice), published in Berlin in 1923. 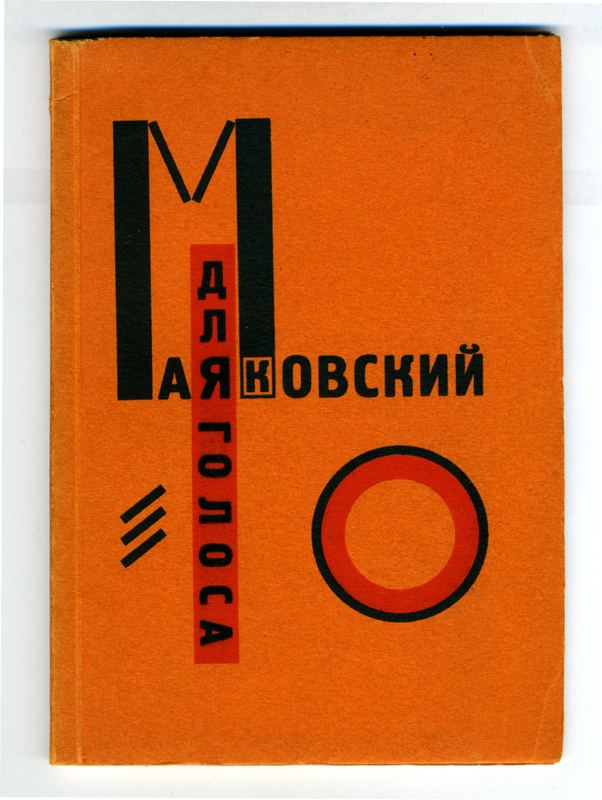 The sixty-one page softcover work, a collaboration of Russian poet Vladimir Mayakovsky (1893-1930) and designer El Lissitzky (1890-1941), rhythmically interlaces innovative constructivist style layouts and patterns with thirteen futurist poems. For the Voice documents and promotes the theories of avant-garde art and literary movements that emerged in the early 20th century, reflecting a time of great political and social change in Russia. Mayakovsky was a Russian Futurist who, like his Italian counterparts, was drawn to the speed and restlessness of modern life and machines. His creative poetry aroused controversy, appealed to the masses, and criticized established political and social systems in Russia. 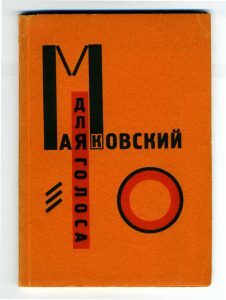 Like Lissitzky, he emphasized the shape of letters, the placement of text on a page, and the importance of typography over traditional grammar, syntax, and logic. He felt that designing the spatial arrangement of a poet’s words on the page is akin to that of an artist arranging colors and lines on a canvas. Such an arrangement of words gave the poem visual significance as well as artistic and poetic expression. Lissitzky, an artist, designer, photographer, typographer, and architect, was a major exponent of Russian Constructivism, an art movement whose aim was mass communication connecting art to everyday life. He believed that books with bold geometric forms, clean layouts, and photographs could effectively connect to and transform the consciousness of the viewer. Every aspect of the designs in For the Voice was carefully planned by Lissitzky. He constructed images by combining typefaces of various sizes printed in red and black ink with abstract geometric shapes that graphically related to each poem. Left March (pictured here), a poem written to inspire sailors, includes an iconic image of a ship, the repeated word “left” and bold letter “M” to indicate marching commands, as well as a series of three diagonal lines as a diagrammatic depiction of kicking legs. Lissitzky describes his illustrations as the following: “My pages stand in much the same relationship to the poems as an accompanying piano to a violin. Just as the poet unites concepts and sound, I have tried to create an equivalent unity using the poem and typography.” He also assigned a distinctive symbol to each poem placing it on index tabs so that each work—meant to be read aloud as the title suggests—could be easily found. For the Voice is an important addition to the Cooper Hewitt Library’s collection of books designed by artists. It represents an important time in graphic design history in the early 20th century when artists were exploring abstract forms as well as the relationships of various media –film, poetry, music, theater, and literature, to art. 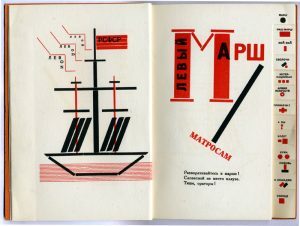 The book is also a great example of constructivist design that is ideal as a resource for teaching the history of printing and graphic design history as well as an artifact that enhances the Cooper Hewitt, Smithsonian Design Museum’s collection on period Russian propaganda art and the work of El Lissitzky. This acquisition was generously funded by Margaret Caldwell, Devon Caraher, Brian Coleman, Cooper Hewitt Library endowments, Parsons The New School Program in The History of Decorative Arts, the Smithsonian Libraries Special Collections Fund, and Stephen Van Dyk. (-: fabulous and now to find a recording of the poems in this book, please.